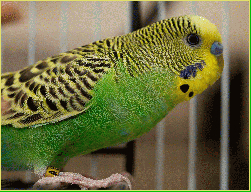 Jericho the budgerigar came to Mickaboo from one of our bay area animal shelters (he was a stray). Jericho likes to rock himself to sleep. He has a polished manzanita perch situated next to a hanging swing, and every night he`ll get situated on the perch and spend some quiet time there. After a few minutes, he`ll begin pecking and pulling at the swing, making little chittering sounds as if he`s telling it where he wants it to go. As soon as the swing is in exactly the right position and moving at the right speed, he`ll jump onto it with all his tiny budgie strength, causing it to swing back and forth with some gusto. He sometimes has to flap his wings a bit at first to keep his balance, but, as the swing slows down, Jericho will first close his eyes and then make the tiniest beak grinding sound until he falls asleep. Progress report: Jericho is doing fine in his foster home and has made friends with other parrots in the household. He eats leafy greens and will sometimes nibble on broccoli. He`s a handsome young bird and most of the bars on his head have grown out.